Hezbollah’s Al-Manar TV reported that a truce sponsored by the Lebanese army begins at 4:00 p.m. between the rival Tripoli neighborhoods of Bab al-Tabbaneh and Jabal Mohsen. This comes after clashes between the rival Tripoli neighborhoods continued on Saturday and resulted in the killing of one person and in the wounding of several including three soldiers . 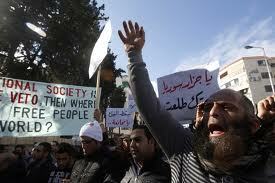 This is the second day of violence involving supporters and opponents of Syrian President Bashar al-Assad. The coastal city is dominated by Sunni Muslims who support the 11-month uprising against Assad in neighboring Syria, but is also home to members of Assad’s Alawite Muslim minority who are loyal to the Hezbollah-led alliance which is backed by Iran and Syria. Earlier today Interior Minister Marwan Charbel voiced concern that the clashes may be the beginning of strife in Lebanon as one form of the repercussions the unrest in Syria will have on the country. “This situation requires decisive positions from the president and various political leaders,” he stressed. President Michel Suleiman did cal on the military and security forces deployed in Tripoli to “firmly suppress those disrupting security and civil peace.